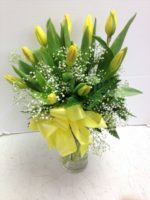 When you send the Dreamy Dawn to your girlfriend, sister, aunt or mother, you’ll make her smile all day long! 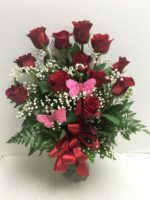 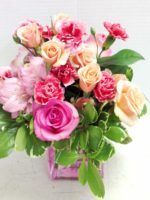 It’s bright, cheerful and festive roses, carnations, alstroemeria and more, in colors that are certain to cheer her up and keep her happy! 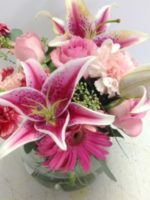 The Dreamy Dawn arrangement is a great way to say “Have a great day”! 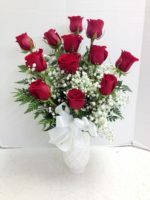 Sure, we take that expression for granted, but it really is a nice way to say Be Blessed, Be Happy or I Love You. 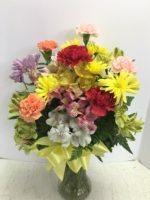 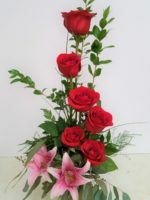 Perfect for a birthday or anniversary, this is a fun floral arrangement as a get well sentiment, for grandmother’s day, if you’re “in the dog house” or if you’re in love! 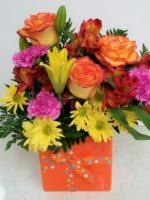 If you’re looking for other ways to make her smile, consider our Can’t Help But Smile Gift Basket or our Smile Bouquet.